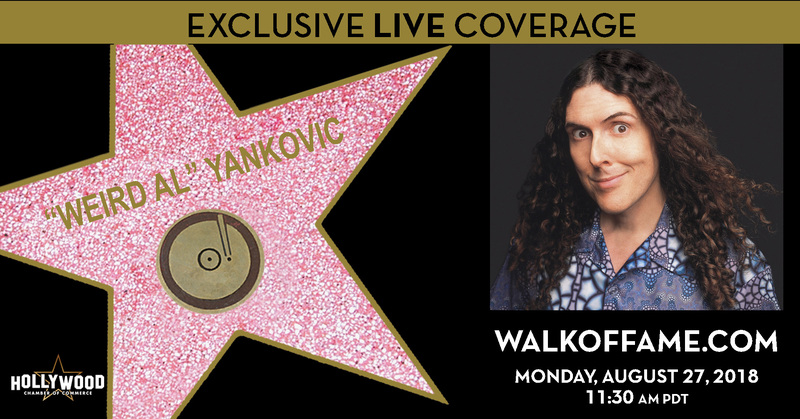 The Hollywood Chamber of Commerce is proud to announce that performer “Weird Al” Yankovic will be honored with the 2,643rd star on the Hollywood Walk of Fame on Monday, August 27th, at 11:30 a.m. PDT. The star will be dedicated in the category of Recording at 6914 Hollywood Boulevard across the street from the TCL Chinese Theatre. “Weird Al” Yankovic will be honored with the 2,643rd star on the Hollywood Walk of Fame on Monday, August 27th, at 11:30 a.m. PDT. The star will be dedicated in the category of Recording at 6914 Hollywood Boulevard across the street from the TCL Chinese Theatre. to the Dr. Demento Radio Show – would go on to become a pop culture icon and the biggest-selling comedy recording artist of all time, with classic song and music video parodies such as“Eat It,” “Like a Surgeon,” “Smells Like Nirvana,” “Amish Paradise,” “White & Nerdy” and “Word Crimes.” Now in his fourth decade as America’s foremost song parodist, he has been the recipient of numerous awards, including four Grammys® (out of fifteen total nominations) and a string of Gold and Platinum albums.